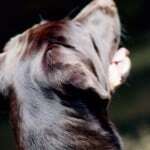 Today’s post is about Acupressure. 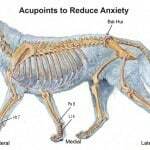 We had a number of acupressure classes when I was at Bancroft, but I have to confess that at the time, I was so focused on learning massage that I found it a bit overwhelming to look at health from a TCM perspective, which is pretty different from the way you’re used to looking at and diagnosing illness in the West. However, one experience I had in those classes really stood out in my mind. At the time, I had had a cold for several months, with a cough that was so bad that I had broken a rib just from coughing! I mentioned it to our teacher, who asked if I had lost someone close to me recently. I was stunned by the question: my Mom had passed away 5 months earlier and there was no way my teacher could have known that. Turns out the lung meridian is connected to grief. Interesting, isn’t it? 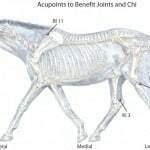 Since then, I have studied acupressure further on my own on a sort of leisurely basis, and frequently use it on myself for things like headaches, colds, soreness, stomach bugs, low energy, etc. It really is amazing how well it works. 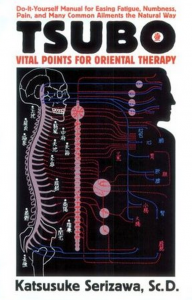 A great book on human acupressure if you want to try it out on yourself is Tsubo: Vital Points for Oriental Therapy . I pull that out whenever I have something that needs treating. Acupressure is a Traditional Chinese Medicine (TCM) healing method which has been practiced in Asia for thousands of years, and has slowly but surely been gaining acceptance here in the west as well. It is based on the theory that energy (“chi”, “qi” or “ki”) is constantly flowing in the body, along 12 main pathways called “meridians”. Each meridian is connected to a certain organ, and has a symmetrical “twin-meridian”, mirrored on the other side of the body. For example, the stomach meridian runs from a point right under each eye to the lateral edge of the nail of the second toe on each foot. When the flow of energy gets blocked, from stress, trauma, injury or even negative thoughts, problems arise. We don’t feel well and are more susceptible to illness. 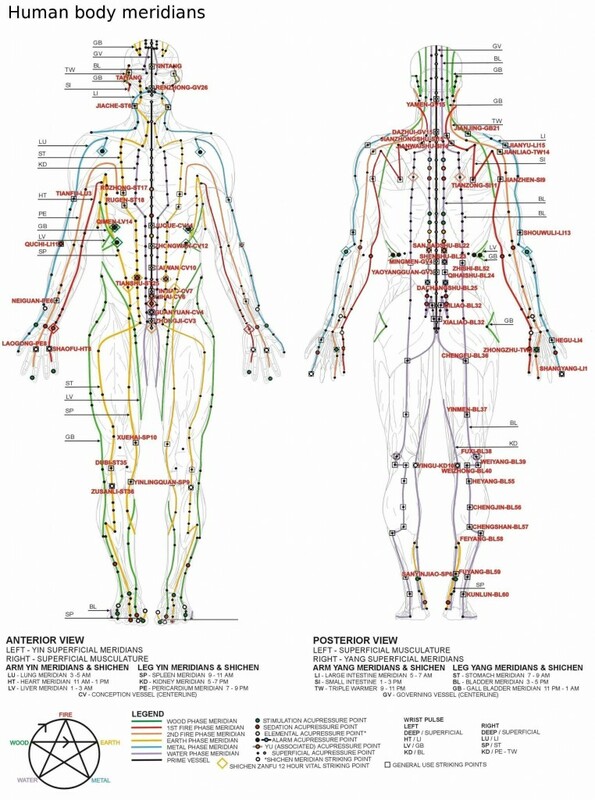 The acupressure practitioner deals with these blockages by using finger and palm pressure on certain points called “acupoints” which are located along the meridians (there are more than 400 of them). At these points, the energy is closest to the surface, and working on them helps improve the flow of chi and restore health. 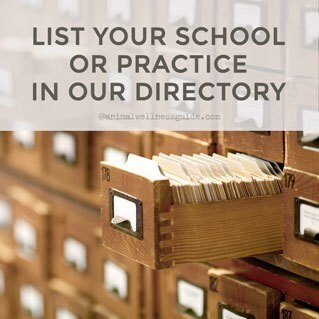 To decide which points to work on, the practitioner goes through a whole list of things, known as the Eight Principles. To explain all that would take up too much space here, if you are interested in learning more about that, I highly recommend getting a book on the subject (for animals, I can highly recommend Acu-Dog: A Guide to Canine Acupressure. 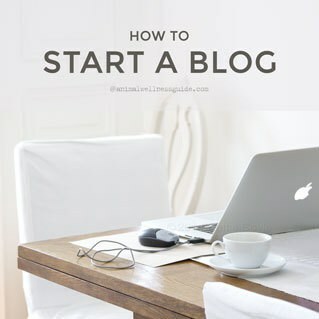 The authors explain TCM in a really clear and easy to understand way). Today’s case study comes from Jodi McLaughlin, a Certified Holistic Small Animal Massage Provider, Nationally Certified in Therapeutic Massage and Bodywork, and the creator of The Blissful Bunny Massage Workshops. 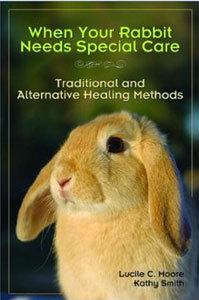 She has written many articles on alternative healing for rabbits, and is also featured in Lucile Moore’s books, Touched by a Rabbit and When Your Rabbit Needs Special Care: Traditional and Alternative Healing Methods . Jodi has spent many years working on both animals and humans, but one rabbit in particular touched her life in a very special way. Jodi met Diego Cinqo De Mayo Rivera in 2003, and it was love at first sight. Diego was paralyzed at around 6 months of age and Jodi started working with him 4 months later (and continued to work on him for 5 years). He briefly regained use of his hind legs but arthritis and nerve/soft tissue compromise caused the return of the hind leg paresis. 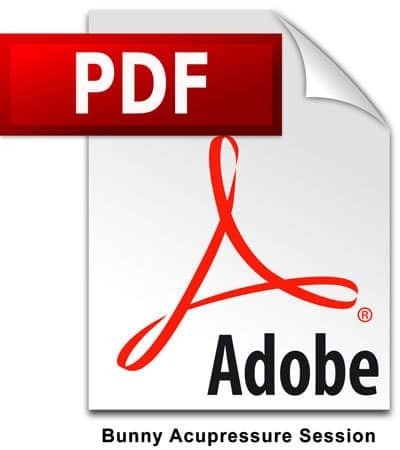 The pdf to the right is a full record of one of the acupressure treatments Jodie did with Diego for those of you who are interested in how she decided which points to work on, and how Diego reacted to it. Diego was born sometime in 2002 at an animal hoarders home in Mar Vista, CA and was rescued (along with 400 other rabbits) in a SPCA raid the same year. On May 5th, Cinqo DeMayo, 2003, Diego, just a very young bunny, was being bonded in the lobby of the No-Kill L.A shelter he had been taken to. The story goes that he got too excited and slipped on some water, injuring his back. Because he was only a shelter bunny, he was given a brief exam, xray, single dose of pain med, and put back in a cage. His back was not broken but there was obvious soft tissue damage to the mid spinal area. A friend of mine, Bona Tucker, had opened a rabbit shelter, and since Diego could no longer be bonded or available for adoption, he was sent to Bona’s home rabbit sanctuary where he languished in a small pen with all the other un-adoptables. September of that same year I was in Animal Massage School in Ojai, CA and met Bona. During a tour of her sanctuary I saw the most beautiful little gray “American Chinchilla” rabbit. He had huge chocolate brown eyes and just an aura that said “here I am” even as he sat amongst gobs of poop in a corner of a pen with his back to me. His hind legs were twisted from paresis but he could still maneuver quickly around his pen. I fell in love and knew I would be back to take him home where I could foster him and try all my new bodywork techniques. He proved to be a true California rabbit. Our opinionated “Vitamin D” bunny loved the sunshine, fresh ocean air, and organic herbs my beach cottage offered. Massage, Tellington Touch, Acupuncture and Acupressure treatments gave him improved mobility but over time complications from his injury caused incontinence and frustration. We ordered a custom made Doggon Wheels cart in September ’04. After a short adjustment period, he understood the benefits of the cart and laid patiently on the grooming-massage table while I hooked him into his “chariot”. He took off running as soon as his powerful front legs hit the floor. We nicknamed him “Ben-Hare” which says it all about his amazing personality and stamina. We gave him daily baths, bodywork, regular bladder expression, fresh cranberries and other herbs for his urinary and immune system. When we moved to the Amish countryside of P.A., Diego bonded with our blind bunny Tabby and friend Berry. Diego’s disability and my struggles to understand it lead me to Amy Spintman, Educator of The San Diego Chapter of The House Rabbit Society. After a few phone conversations, Amy founded the highly respected Disabled Rabbit List on Yahoo. 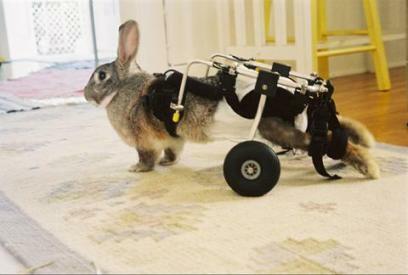 Diego became an ever present sage to many up and coming “differently-abled” bunnies around the world. 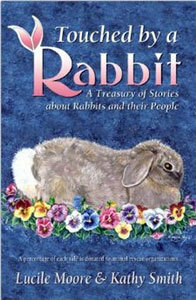 Diego was also immortalized in Lucile Moore’s books, “Touched by a Rabbit” and “The Care of Special Needs Rabbits: Traditional and Alternative Healing Methods”. As July [of 2008] approached, Diego was experiencing more and more health challenges, finally succumbing this morning to the always looming complications from his original spinal injury. We learned yesterday that his body was in the final stages of kidney failure and his digestive system had begun to shut down from the physiological stress. Diego was with me on the futon early this morning, snuggled into a warmed wrap, as he started the journey out of his little earth fur suit. 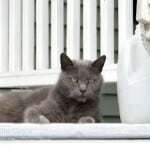 Rick and I held him and told him we would be ok and he soared away, presumably to find Tabby at the Rainbow Bridge. More than likely he is munching on some herbs in a celestial garden somewhere contemplating his next move, “diff-abled” no more. To those people who believe rabbits should be housed in a hutch at the end of their yard, or next to the garage, out of sight and mind, I say, look at the incredible life of a little 4 lb bunny and all he offered to the world. He was the most amazing animal Rick and I will ever know and we were honored to assist him during his stay here on earth. He had a wonderful quality of life and the most amazing bond with me that I have ever experienced with an animal. As I always tell people, he was a Buddha in a bunnysuit. Jodi is currently taking a break from treating animals due to family obligations, but don’t miss her other guest posts here on AWG: The Basic Bunny Massage Strokes and Massage And Acupressure Treatment For Rabbit Digestion.